The most anxiously awaited release from the masters of gothic/horror soundscape, this disc delivers! 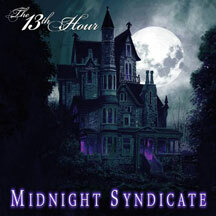 Set in a haunted Victorian mansion, The 13th Hour features Midnight Syndicate’s signature blend of dark, gothic orchestration blended with 80’s-style horror movie music, and chilling sound effects that draw you into the halls of a haunted house with a sinister history. The ultimate Halloweeen horror soundtrack for any gothic music, ghost-hunting, or haunted attraction lover. Turn off the lights and light the candles as spectral sound effects blended with the music make The 13th Houra truly unique and interactive listening experience. Perfect background for horror RPG or boardgaming adventures. Officially approved by Chaosium Games for use with the “Call of Cthulhu” RPG.